This Solna location is incredibly well-connected. You can benefit from immediate access to the E4 highway, a direct road to Stockholm, which is only a 20-minute drive. Serviced offices are available, with modern furniture and dedicated internet connections in whatever size you need - whether it's for two people or twenty. 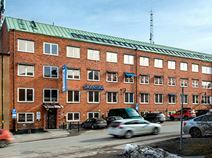 This business centre offers a wide variety of office solutions for you and your company in the heart of Solna. This office space is available on an all-inclusive basis, on flexible terms - ideal if you plan on expanding your business at a rapid rate. A casual 15-minute walk from Solna station this suburban business park location offers open-plan and private offices, plus spacious meetings rooms. The site is accessible 24/7 allowing you to work through any hour you desire. Thanks to the proximity to the renowned Karolinska Institute and adjoining university hospital, this locale is popular amongst biotech and medical science companies. There are events spaces close by, as well as several museums and an abundance of restaurants. An impressive business centre featuring a range of furnished office-spaces available to let on flexible terms. Here, tenants can make use of a wide range of amenities including high-speed internet, meeting rooms, conferencing facilities and disabled access. The business park in which this centre is located also provides a restaurant and bakery, as well as ample networking opportunities with other like-minded professionals. Opening in September 2019, this brand-new and modern co-working space is located in an eco-friendly building in the heart of Solna. Offices are bright, spacious and filled with natural sunlight flooding through large windows. Private offices are available under flexible and affordable terms and come fully equipped to a premium standard with ergonomic furnishings. The building also boasts a beautiful rooftop garden and a range of facilities such as rentable meeting rooms and private phone booths. Located in one of Sweden's most modern and dynamic districts, these fully furnished offices offer a highly professional environment for your business. They are immediately available, equipped with state-of-the-art technology, fast internet connection and advanced videoconferencing facilities. Provided with a full range of services, including professional and expert support staff, these offices are close to the city centre and well served by public transport. A short five-minute drive from Bromma Stockholm Airport, this outstanding centre provides the ideal location for IT sector businesses looking for flexible workspace and spacious meeting rooms. There is 24-hour access for your convenience. On-site amenities include a fully-manned reception, restaurant and chillout/kitchen areas. The local area is home to dozens of companies from different sectors with whom you can network with ease.